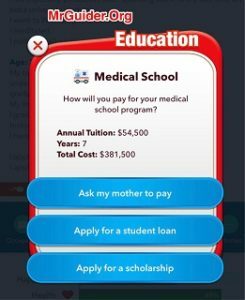 BitLife – Life Simulator Medical School – How To Become Doctor? Becoming a doctor in BitLife – Life Simulator is pretty easy. All you need to do is get a degree from the medical school and then apply for the doctor post in one of the job listings. But there are some things you need to take care of to get into the Medical school and apply for doctor post in BitLife – Life Simulator. You will unlock the doctor achievement as soon as you get approved for the doctor post in a hospital. Follow this complete walkthrough and that’s it. (TL;dr walkthrough – To get into the medical school, you will have to choose the right education career after graduation from high school. That’s biology and Psychology. After that, you will have to apply for medical school and work hard every year. Then, after graduation from medical school, you will be able to get the doctor post in one of the available hospitals). So let’s get started; BitLife – Life Simulator Medical School and how to become a doctor! ⇒As you already know that when you start the game, the game randomly picks a virtual character for the player. Before you continue with a virtual character life, pay attention to its stats. Since we are talking about the doctor and medical school, looks don’t matter. But other stats such as happiness, health, and smartness matter. We would recommend you to continue with the virtual character who has good smart stats(over 85), happiness(must be green), health(over 80). If the virtual character is not smart, we would recommend you to start a new life. 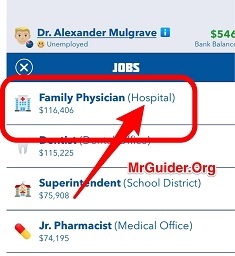 ⇒To become a doctor or get approved in medical school in BitLife – Life Simulator, you must study hard every year in school. While studying in the school, visit the library every turn and maintain the smartness. To study hard, you tap the school button and choose to study harder. ⇒After graduating from high school, you will have to make an important decision regarding career choices. If you want to get into medical school and become a doctor, choose biology or psychology. Getting an undergraduate degree in biology or psychology can help you to get approved for medical school. ⇒While studying at the university, make sure to visit the library daily and work hard every year. If biology or psychology options are not available, go for chemistry. If none of these options available, start over. We would recommend you to also pay attention to the parent’s work field. If they are working in the medical sector, it might help you. ⇒After graduating from college in Biology/Chemistry/Psychology, you will have to make another important decision that writes your job timeline in BitLife. You can either go for a job or seek higher education to get a high-quality job. Tap the occupation button -> apply for the medical school. You will get approved if you have worked hard in college years, school years and if you have good smart stats. Work hard every year while studying in the medical school -> visit the library daily and keep an eye on smartness. After graduating from medical school, look for the job. Apply for the job in the hospital(For example; Family Physician, Surgeon) and voila! You are now a doctor! You will see the achievement message at the top. 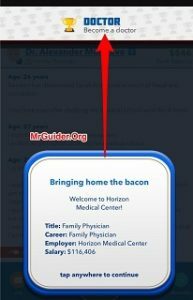 So this is the complete BitLife – Life Simulator game walkthrough guide to get approved in medical school and become a doctor. If you know any other way to become a doctor or get into medical school, comment below! Previous Post:BitLife – Life Simulator Law School – How To Become Lawyer and Judge?